Most of you probably know that last year, Kayla took a leap by quitting her traditional full-time job with a bank so that she could become her own boss, work her own hours, and start her own business. I too started my own freelance business, and honestly, I don’t ever want to look back. There is something immensely freeing, empowering, and thrilling about creating your own work, earning your own money, and being your own boss. With no one telling you what to do, when to do it, or how to do it, you can start living your life on your own terms again. Arguably the most thrilling aspect of becoming your own boss is the unlimited income potential. You’re only limited by your time, energy, and drive to earn as much as you want. Kayla and I didn’t always know that we wanted to be our bosses, though. It was a process that took time, and we had to recognize the signs that we were ready to be our own bosses. The process definitely doesn’t happen overnight, and you have to be willing to take a few risks once you recognize that you are ready to take that leap. 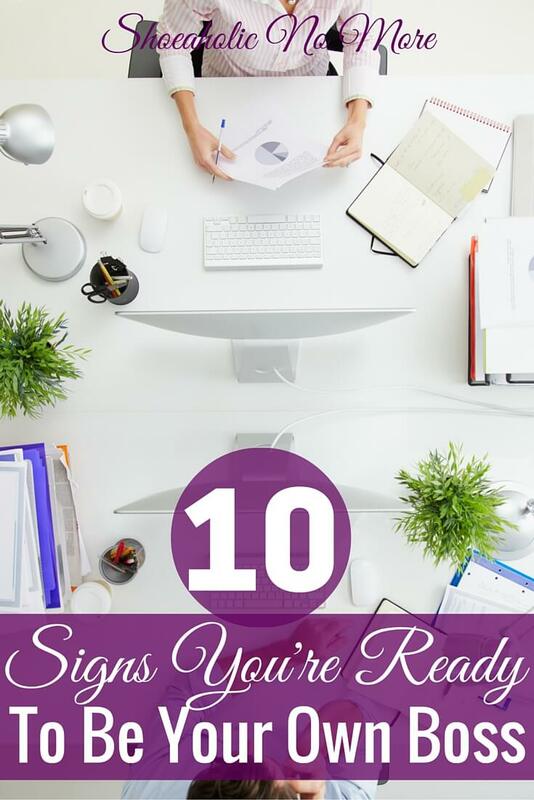 The following ten signs will help you to recognize when you might be ready to take that leap, drop your traditional job, and become your own boss. Do you dread going to work every day? Maybe you hate your job because there is no upward mobility in the company you work for, and you feel like you’re working towards nothing. Perhaps you’ve been overlooked for a promotion one too many times. Or, maybe, the company just isn’t the right fit for your personality. Whatever the reason, if you feel like your professional life isn’t going anywhere, it might be time to stretch your wings and fly into a career of your own making. Do you feel like you never get to add your personal or creative touch? Is everything in your job strictly business and depersonalized? If you love adding your creative flare to your work and business, but your job prevents you from doing so, don’t make yourself miserable by staying in a job that strips you of all your creative input. If you make that leap, you be 100 percent creative with your job, or just add a few personal touches. That’s the greatest part; it’s up to you. If you’re anything like me, you like to keep odd hours. With two young kids, my only real option for getting work done is to work either really late or really early, while they’re still sleeping. If you happen to have a life or schedule that works best outside of traditional business hours, then working a traditional job will add a lot of stress in your life. Why not get rid of that stress and create your own hours? Does your job offer really limited time off? Do you struggle even to take a sick day? If that’s the case, then travel is out of the question for most of the year. If you are at the point in your job where you fantasize about picking up your work and taking off for a new destination, you’re probably ready to be your own boss. If you are your own boss, you can take your work with you anywhere you want to go. (I’m writing this on my way to the beach!) You can take back your life and not be beholden to a corporate policy limiting you to a week of vacation time per year. Do you hate working in noisy offices or cramped cubicles? Maybe your office is dead silent, and you go out of your mind all day wishing for some background noise. If you wish you could regulate the temperature of your office, the noise, and your hours, you’ll most likely work really well from home. Do you like to set personal goals for yourself and your career? If you feel stifled in your job, and you’re unable to challenge yourself in your traditional career, you may be ready to move on. Becoming your own boss will be one of the biggest challenges of your life. If you’re ready to push yourself, be your own motivator, and you don’t need a boss driving you to achieve your personal goals, then you’re ready to be your own boss. As a self-starter and personal motivator, nothing is quite as aggravating as having a boss or manager hovering over your shoulder throughout the work day, micro-managing all of your work. If you’re your own boss, you are accountable to no one but yourself. Not everyone is ready to go straight from college to being their own boss. However, if you work for several years, know your skill set like the back of your hand, and become knowledgeable in your career field, you’ll be ready to branch out on your own. Even if you recognize all of the previous signs in yourself that you’re ready to be your own boss, taking that leap won’t be possible if you’re not willing to take a risk. If you’re a risk taker by nature or just willing to put the life you have now on the line for the life you’ve always wanted, then you’re ready. Becoming your own boss is scary, it’s absolutely terrifying. Setting aside a steady and reliable paycheck can make anyone break out in a cold sweat. Once you take that leap and realize you have what it takes, though, your whole world will change. If you recognized these ten signs in yourself, I implore you to take a hard look at your life and career. Do you feel fulfilled in a traditional job or do you feel stifled? Do you have the opportunity to express your creativity or do you wish could input more of yourself into your work? Ask yourself those questions and think about just how different your life could be if you made the switch. Are you ready to be your own boss? If not, what’s holding you back? I resonated with all of these and I’m just trying to make it through this month honestly. I can’t wait to start working for myself in less than 30 days!